BOTOX ANTI-WRINKLE INJECTIONS in London and Bristol. All our patients request a natural look that means that are still able to have expressions after having botox – it’s not too obvious that they have had ‘work done’. New patients are often particularly cautious about avoiding the frozen look, but we administer botox doses accordingly so that patients have a subtle result that can be topped up after 2-3 weeks free of charge to ensure they are completely happy and get used to their fresher appearance. Our doctor-led London botox clinics are located in Harley Street, Putney, Knightsbridge, City and Clifton (Bristol). Please note there is a £50 consultation fee for appointments with our Aesthetic Doctors, which is payable to secure your booking. This will be deducted from the cost of any treatment carried out on the same day as your online booking appointment. The cost of BOTOX® treatments for the frown lines, forehead furrows and eye wrinkles (both sides is one area) are grouped in 1, 2 or 3 areas in total. A consultation with one of our experienced doctors is £50. Call today for latest availability and last minute appointments 020 7386 0464. Also should you want to have your treatment at your initial visit and assessment it is the same doctor who will perform your treatment as we only have doctors performing botox injections. Other areas such as the bunny / nose lines and around the mouth can also be injected very subtley to enhance the anti-ageing effect. Exisitng patients often get bunny or nose lines and sad smile or marionette lines added in for free in lieu of any discounts and top ups for facial wrinkles for free within a month of the initial treatment. 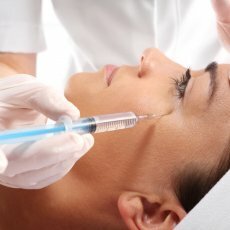 Recent publicity has highlighted that more now than ever before non surgical cosmetic treatments like botox should be done in a medical setting by a doctor to ensure the best results – as of 23rd July 2012 the GMC prohibited prescription of cosmetic injections without a face to face consultation with a doctor. 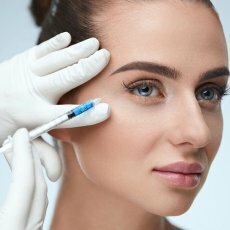 ALL our cosmetic injections consultations and treatments are by GMC-Registered doctors who have been trained to exacting standards and mentored personally by Dr Ross Perry, who personally ensures that all the other doctors use exactly the same techniques, methods and dosing regimes for the best results. 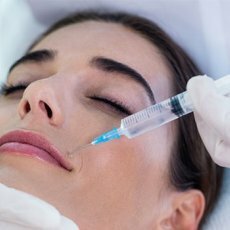 Botox anti-wrinkle injections are available at Cosmedics with experienced doctors with prices starting at just £250 at clinics in London and Bristol. BOTOX® is a safe procedure when performed in the correct setting and by trained medical professionals. It only takes about 5 minutes to administer BOTOX® injections which is not painful thanks to the tiny acupuncture size needles Cosmedics import specially to use. The rest of the time is spent before any treatment is undertaken assessing a patients skin health and what they want to achieve and more importantly discussing what results are realistic and other treatment options. This understanding of the patient’s requirements together with our doctors’ appreciation of facial aesthetics that allows Cosmedics Clinics to maintain a loyal and growing number of patients that all get the best service possible. Our doctors’ success is based on fine knowledge of facial anatomy to assess your skin and the underlying muscular structure to see which treatment is the most suitable. We also use unique HD LED lighting for precise visibility to enable our doctors to get consistent results with minimal pain or risk of bruising. The BOTOX® (botullinum toxin) solution is injected into specific skin points to stop the nerve transmission to the corrugators, procerus and orbicularis oculi muscles of the face to relax the overlying skin. The areas do not loose any skin sensation and the dosing is done so expression is still possible. The full effects are seen about 3-7 days after the treatment. The natural looking smoother wrinkle free skin lasts for 4-6 months. 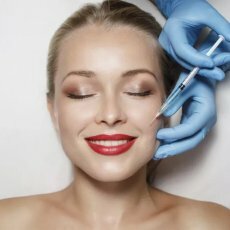 Wrinkle injections and fillers can also be used together to help create a full face rejuvenation effect that can be done at the same appointment. When should I start having botox injections ? The answer to this is really dependent on your own skin type (Fitzpatrick score 1-6 with 1 being very fair pale skin and 6 being dark afrocaribean skin type) and your lifestyle in relation to sun exposure. Fairer patients may start in their late twenties, darker complexions in their early 30′s. Do the wrinkles get deeper when the anti-ageing effects of BOTOX® wear off ? This is a common myth which is incorrect. Any BOTOX® treatment will reduce the overuse of the skin creasing and as a result leave a better result than had it never been done. In fact, repeat and ongoing treatments often mean your skin stands still in terms of aging as it is not subjected to the muscle activity which causes lines. What type of person is BOTOX® best for ? Botulinum toxin treatments are suitable for men and women who want to achieve fresher healthier looking skin. The best results are achieved by injecting areas of facial lines particularly the frown, forehead and side of the eyes. The treatment still allows expressions as well as enabling people to less tired, less stressed and ultimately younger. It can also be used in advanced treatment areas such as nose or bunny lines and to reverse sad downturned looking mouths. However, treatment should be stopped while patients are pregnant or breastfeeding. Are the injections painful ? Patients often ask whether BOTOX® treatment will be painful. The answer is definitely NO, just a slight pin-prick as the needle goes in. Your doctor will fully explain what to expect during the treatment. How do we know that botox cosmetic injections are safe ? BOTOX® has been approved by the FDA in America to be administered for glabella (frown lines) after years of rigorous drug trials. It has been used medically for over 40 years with an incredibly safe drug profile. Its safety results are due the fact that it acts only on muscles or sweat glands and remains active locally rather than entering other areas of the body. BOTOX® is also now used for a range of other medical conditions such as migraines, eye and bladder problems and has a proven safety record when treatments are done by experienced doctors. 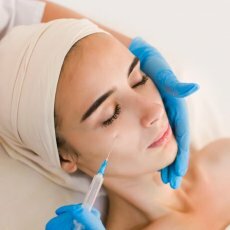 How much does Botulinum toxin injections cost and the prices for each area of the face ? BOTOX® costs / prices start from £240 for women and £250 for men. Call us on 020 738 60464 for more prices. How do I get rid of my other wrinkles and look younger ? BOTOX® is primarily used for the upper third of the face so finding complementary treatments for the middle and lower parts of the face is then a concern for patients who don’t want their forehead to look 10 years younger than their cheeks and jowls. The answer is to try some of the other cosmetic procedures such as dermal fillers, sculptra and dermaroller all of which lift and boost collagen. See skin-treatments overview for further information. What is baby BOTOX® ? This is a where lower dose of botox is given to enable more expression but still a youthful look. It is very common with some celebrities but does not last as long. As long as BOTOX® is given properly there is no need for this gimmick of baby BOTOX®. Are there different types of BOTOX® ? Is there any potential side effects from BOTOX® I should be aware of ? The side effects – if properly administered – are extremely rare at Cosmedics. Our patients occasionally report a small bruise at the injection site that normally fades after a few days. Headaches for the first 24 hours can also happen in 5-10% of patients, which are removed with paracetamol. Side effects are commonly due to poor practice – most likely in cheap or non-medical establishments or overdosing – often include a droopy eyebrow or eyelid that can last a few months. We always recommmend patients not to opt for cheaper providers that are not doctors as we still see lots of problems that sometimes we cannot fix. Is a natural result possible as I dont want friends knowing I have ‘work done’ ? We adjust the dose according to the depth of the lines or rhytids and what you and we feel as specialists will work the best for you to look younger. We can achieve surprisingly natural results. Patients are more likely to be told “You are looking well” rather than “You’ve had BOTOX®”. Your consultation is an opportunity to fully discuss every aspect of your treatment with the doctor who would be carrying it out, in person and free of charge. We actively encourage people to seek independent medical advice before committing themselves to treatment. Questions are always encouraged and our doctors are only happy to carry out any facial treatments once patients are fully educated about all the options. What else is there if I do not want BOTOX®? At Cosmedics we believe in patient choice and will always accomodate this to ensure the patient gets the best cosmetic outcome that agrees with their personal wishlist. Often some anti-ageing treaments work better in some areas than others. However Facial Fillers, chemical peels or Dermaroller can also be used in anti-ageing treatments. All our doctors are extremely busy and early booking is advisable. Should the doctor who has seen you previously not be available, don’t worry. All doctors use the same methodology that Dr Ross Perry has perfected. Your detailed notes will enable our other doctors to ensure the best reproducable results.